Rockstar has released a few new downloads that include desktop wallpapers, screensavers, avatars, and buddy icons. You can find them here. Rockstar has also released a new poster for GTA IV which you can order for .00. 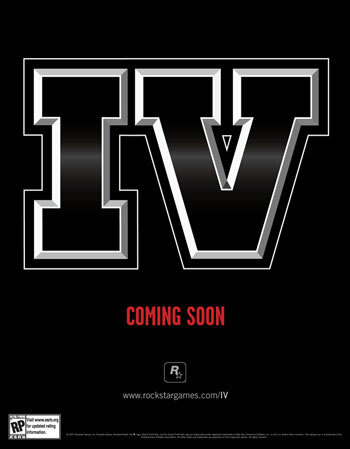 This poster just shows the generic GTA IV logo with the "RP" rating and red text that says "COMING SOON". You can order that here. If you've been searching for mods today you will have noticed our brand new downloads database. I've been coding it on and off for the past few months, and it's now finally complete. All our old mods are still there so don't worry about it being empty, nothing has been lost, and all old links will redirect to the new URLs. Below is a summary of what's new and what's been improved from the old system. If you're interested you can read about all these features in detail in the downloads database overhaul topic on our forums. Remember if you want to submit your own modifications for inclusion in our database, you'll need to be a member. If you aren't already, head on over to our forums and Register now - it only takes a moment. So if you're bored waiting for GTA IV to be released, find yourself some nice mods in our downloads database for your current GTA games. Feedback and comments are appreciated, also let us know if you find any bugs/problems while using the new system. Hopefully everything should be faster than the old one. Also, keep in mind we have even more new features planned, including the ability to add your own comments to mods, different viewing options when browsing categories, and instant file ratings. As well as this we'll also be adding links to tutorials on how to install mods for your games, however, until these are up, please make good use of our forums. The latest issue of GamePro has brought up a few new minor details about GTA IV, they saw the same missions we heard about during the last lot of previews so there's nothing really exciting here, just a few interesting snippets of information. The HUD is described as "minimalist to its core." There is a mini-map, a "low-key" cash counter, and they say that the HUD in general looks more clean than in previous GTA games. Ammu-Nation no longer exists. We've heard about the new ways of acquiring weapons, namely from Little Jacob. GamePro is the first magazine to confirm that Ammu-Nation has been dropped. A fare meter appears on-screen as soon as Niko enters a cab, and the camera pans around it as it drives. The little green guy on crosswalks is crisp and clear. Clothing in GTA IV is described as "customizable, and also realistic." On shooting, the magazine states that: "the cover system borrows elements of Gears of War, and Rainbow Six: Las Vegas." It also says that "the aiming is a Resident Evil 4, over the shoulder style." In other news, Gamesindustry.biz is reporting that an Australian band called "Airbourne" will have some of their music in GTA IV. ... Not only will those artists find telling exposure to key target audiences within EA's own titles, but some will also find themselves as part of other games as well � Melbourne band Airbourne will also be featured in the new Tony Hawk game, as well as Grand Theft Auto IV. Since there's no news at the moment I thought I'd update you all on the progress of San Andreas Multiplayer which saw 2 bugfix releases last week. Below is a summary of what's changed and following that are download links. * Chat window is now scrollable with upto 5 pages of text (50 lines). * Chat window now wraps text properly over multiple lines. * Chat entry improved, it allows upto 128 character messages, supports selection, copy and paste etc. * All text rendering has been heavily optimised. Chat text now has no noticable impact on framerate. * Name tags cannot be seen through walls/objects. * A car mod shop crash applying certain car mods has been fixed. * Pickup limit increased to 400. * The server can now disable all interior entrances/exits. * Native sqlite database support for pawn. Sqlite is a lightweight alternative to the mysql plugin. * The name tag drawing distance can be set from the server. * Insane stunt bonuses can be toggled on/off by the server. * Various netcode security updates. * 0.2.2 will use the second major version of SAC. * Player head movement sync added. Player's characters will look in the direction their camera is looking. * A new cellphone action enables players to hold a cellphone and look like they're on a call (useful for pen1 based scripts). * New usable skins; Tenpenny, Pulaski, Hernandez, Ryder, Smoke, Sweet, Mafia Boss. * Bandwidth and ped sync improvements. 0.2.2 will consume less server bandwidth than 0.2.1. * Fixed bug with setting player colors of players 100,101,102. * Increased timeouts to prevent connection loss. * Decreased CPU time required to process vehicles on the client. * Fixed animation problem with fire hydrant and spray can. * Fixed nametags with no player issue. * Fixed an issue where the client wasn't displaying "You are banned", "Server is full." messages. * Some crashes related to models/pickups. * Collision processing issues (may fall through the ground). * Chat window wrapping server messages. * Texture rendering if your graphics card uses a custom d3dx9_25.dll. I've updated the download page, and you can download SA-MP 0.2.2 from our new downloads database, we haven't quite finished coding it though so I'm giving you a little sneak peek here. If you're looking for server releases then head over to the SA-MP website.